Because he failed to “drain the swamp”! 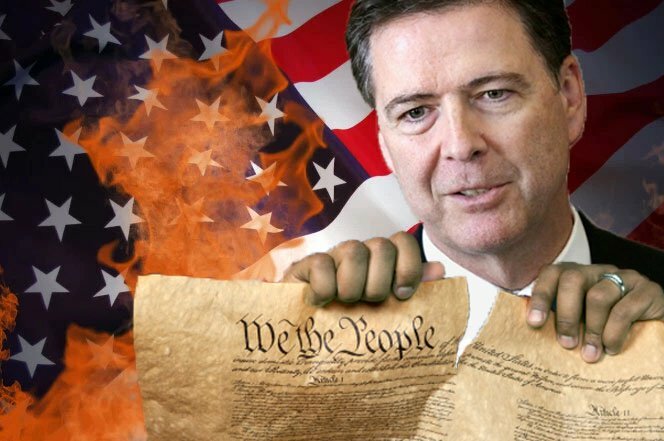 FBI Director James B. Comey destroyed the rule of law in America; hence, Trump should have removed him on his first day in office. Comey inflicted irreparable damage on the Federal Bureau of Investigation. Nonetheless, the bad timing has understandably put Comey’s termination under a cloud of suspicion. Much has been written, and will be written, about the fact that Comey’s directorship at the FBI was the most destructive tenure in the history of American law enforcement. Even watching such a shocking display of arrogance and hubris during his various press conferences and congressional hearings was too much for most law-abiding citizens to endure. His willful blindness toward the unending crime spree perpetrated by the Clinton crime syndicate was stunning for its complicity…IN BROAD DAYLIGHT. At the end of the day, James B. Comey succeeded in completely destroying the rule of law in America. He irreversibly devastated the integrity of federal law enforcement and the credibility of the FBI. And, he forever undermined the faith of the American people in their law enforcement institutions nationwide. First of all, Trump had every reason to fire FBI Director Comey as his first official act as POTUS. He did not do this as he was elected to do. Instead, he made a political show of his confidence in Comey as seen here. This profound error of judgment was only validated repeatedly throughout Trump’s first 100 plus days in office. Secondly, with each and every public pronouncement that Comey has made, he only further exhibited his extreme partisanship and political posturing. More importantly, his continued unlawful initiatives and willful neglect demonstrated that he was incapable of discharging his duties as FBI director. In short, Comey appeared to be much more criminal than law enforcer. Nevertheless, Trump ill-advisedly kept him in the senior law enforcement position in the nation. Thirdly, by all appearances, Trump only fired Comey after it became clear that the FBI Director was being used by Congress, as well as his hidden handlers, to legitimize the fake Russian conspiracy to alter the 2016 election outcome. As a matter of fact, Comey’s recent testimony before the Senate Judiciary Committee on May 3 was all-out attack on the truth behind those fabricated Russian hack accusations. His transparent patronization of several committee members and obvious prevarications that fueled contrived suspicions against Russia were quite stunning. By feeding patently false information to naked warmongers like Senators Lindsey Graham and Richard Blumenthal, Comey substantially heightened their inflammatory war rhetoric. In light of Comey’s groundless allegations pertaining to Russia, he ought to be considered as a menace to society and threat to world peace. Since his July 5th press conference last year, during which he indicated that the “FBI recommends no charges in Clinton email probe”, Comey has been in a race to the bottom. He has shown an extraordinary willingness to trample on the Constitution, shred federal law and the U.S. Criminal Code, as well as ignore the generally accepted principles and procedures of American law enforcement. In a word, Director Comey went rogue like no one before him. There is no question that Comey had to be fired; however, Trump should have done it on day one in the Oval Office. For all the reasons previously stated Comey proved himself to be a ticking time bomb. Nevertheless, it did not have to come to so much partisan flame-throwing, especially by Trump’s own party. The GOP warmongers were using Comey to build their fraudulent case toward war with Russia. The Democrats were likewise using Comey to confirm their bogus narrative regarding Clinton’s epic defeat “at the hands of the Russians”. Had Trump not fired Comey in view of his outright lies and deceptions, the president’s inaction would have caught up with him sooner or later. So Comey absolutely had to be fired. Unfortunately for Trump, it now appears that the ouster of Comey is the result of the administration’s attempt to thwart and/or cover up the totally fake investigation of Russia. This whole debacle could have been avoided had Trump terminated Comey’s directorship at the very beginning of his term, and done so for the right reasons. That was the proper and honorable thing to do. The entire Alt Right has been demanding for Comey’s removal since the middle of 2016. Hence, Trump’s personnel advisors clearly did not serve him well in this regard. Candidate Donald Trump promised on numerous occasions to “drain the swamp”. Not only has he neglected to “drain the swamp”, he has filled it up with warmongers and traitors, thieves and murderers. This highly volatile predicament concerning Comey is blowing up because of his broken promise(s). Especially his promise to “drain the swamp”. His loyal base took him at his word during the campaign season and he has let them down in a HUGE way! Swamp monsters now staff all levels of the Executive Branch (e.g. PEDOGATE: Alex Acosta’s Nomination for Labor Secretary Must Be Rejected). Let’s face it: no one ever gets away with breaking so many serious promises. Circumstances have a funny way of conspiring to show the POTUS that his word must be kept. Once he took occupancy of the White House, Trump became particularly vulnerable to all manner of plots and schemes implemented by the Highest Power that put him there. Each of these can, and will, be executed at a time when Trump is most susceptible to receiving the higher message. Whether this was due to his gross misjudgment of Comey’s character, or because he was foolishly advised by his political confidantes, Team Trump screwed up BIG time. Some White House analysts even suspect that such a disastrous move was deliberately engineered by Zionist consigliere Jared Kushner. After all, Trump’s son-in-law is a dyed-in-the-wool globalist who has exerted tremendous influence with Trump since the very beginning. Is it any wonder that the very first swamp monster to dangerously attack the chief Trumpster was a 6 foot 8 inch Frankenstein by the name of James B. Comey? Truly, there is no one scarier than an FBI Director who literally makes up stories and fabricates evidence out of thin air. All of Trump’s enemies have been foaming at the mouth ever since Comey enthusiastically took up their cause to smear Team Trump with fictitious allegations related to the non-existent Russian election hack. If that investigation by Comey & Company was left to its natural progression, it would have undoubtedly led to Trump’s impeachment for conspiring with the Russians (i.e. for seditious acts which never even occurred).